Hardwood flooring is now available as engineered hardwood flooring – a great innovation that enhances the use of real hardwood, and costs a fraction of solid hardwood. 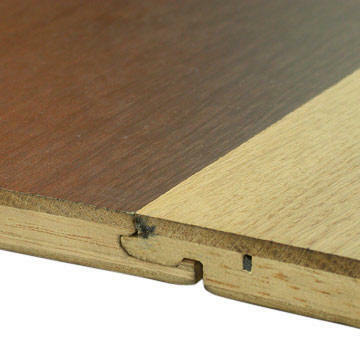 An engineered hardwood floor is constructed with several layers. The top layer is real hardwood, which means the floor you stand on is the same genuine hardwood you always dreamed of owning. In fact, it has several advantages over solid hardwood flooring. Because the other layers in an engineered hardwood floor are made of plywood or high density fiberboard, the engineered hardwood resists the tendency of solid hardwood to expand and contract with changes in humidity and temperature. 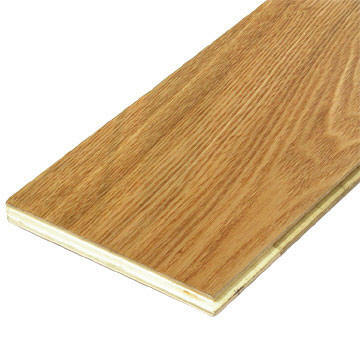 Engineered hardwood flooring can also be installed over radiant heat, where solid hardwood would be severely damaged. .Our 3 layer Engineered hardwood flooring is a prefinished, glue less, 14.5mm engineered natural floor, with a nominal 4mm real timber veneer wear layer. For the surface plank you have the 2strip/3 strip and one plank choice. We have also Engineered hardwood flooring with one plank/2strip/3 strips in multiply structure, with T & G.
6) Species you can choose oak, maple, ash, merbau and teak and others. 3) Special size upon request. 5) Deliver time: 4 weeks production time after order.